I’m challenging myself in 2017 to create one necklace a week using only the beads from one drawer of my 52 drawer Apothecary Chest. In the glass bead world, a hierarchy of three levels exists: American Art Glass (officially called “furnace beads”); lampwork glass which I use a lot; and blown glass (see Drawer #1). These American Art Glass beads were designed by David Christensen, Rhode Island, and I used to buy them from him by the hundreds when I lived in California. This dark green color was attractive to me because when you look closely, it sparkles due to the silver foil with which he embellished the green. To get wonky for a moment, “furnace glass” is an American adaptation of an Italian method called “latticinio” which uses glass canes—like all three levels do—and encases them in clear glass, then manufactures them in large scale furnaces. They are not individually made, like lampwork and blown glass. 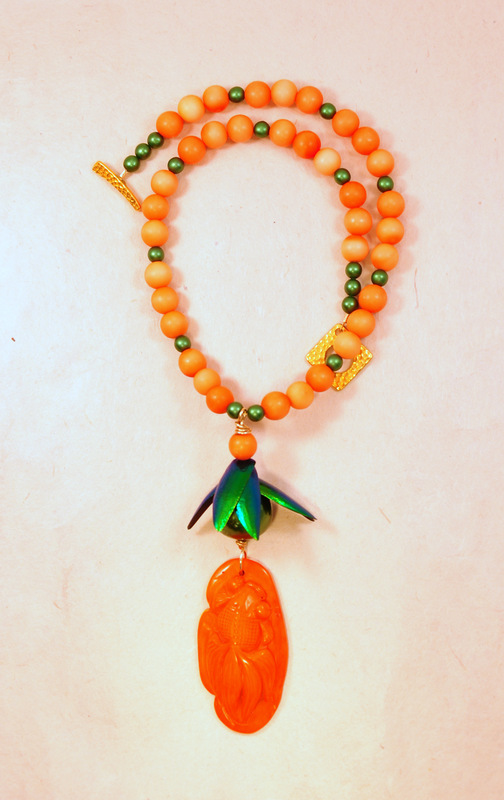 The most predominant stone in this necklace is green aventurine, which is from the ubiquitous quartz family. Sometimes I have to look twice to identify these beads since jade comes in a similar shade of green. Also featured are some lovely pressed glass beads made in West Germany. They were hand made from 1948 to the 70’s, when they switched to machines. I bought these vintage beads from a CA vender in 1995, so there is a chance they were hand-made. They are the distinctive bullet-shaped beads and the leaves with white stripes. 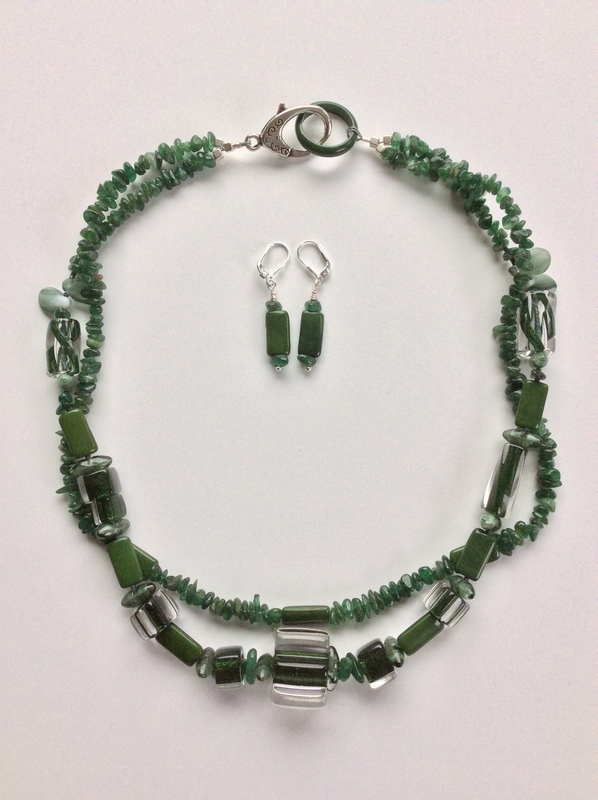 Green Aventurine has some interesting properties: they are the heart chakra; they comfort; they settle nausea; and they give courage to the wearer in social situations. In my quest for an unusual clasp, I found a green glass circle and paired it with an oversize pewter lobster clasp. This two-strand necklace measures 21” and earrings are included. It is $99. 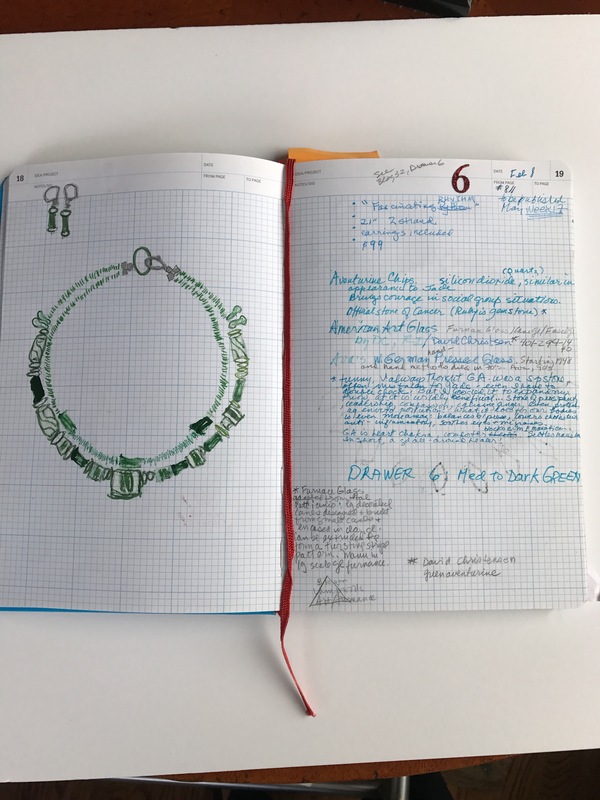 Part of the fun of each week’s necklace challenge is journaling in my “Maker’s Notebook”. It starts on the right where I leave four spaces for data which can only be entered after I finish the necklace. The body of my scribbles are thoughts that emerge as I am designing, then stringing, then closing off the necklace and earrings. On the left, I then do a drawing and color it in. I draw after completion; my design process lets the beads percolate as I gather piles of them–a process too intuitive to draw in advance. I’m challenging myself in 2017 to create one necklace a week using the beads from one drawer of my 52 drawer Apothecary Chest. Welcome to Drawer 5. This week was fun to look forward to: Drawer 5 had so many shades of green from the lighter end of the spectrum that, before I knew it, a large pile had accumulated. 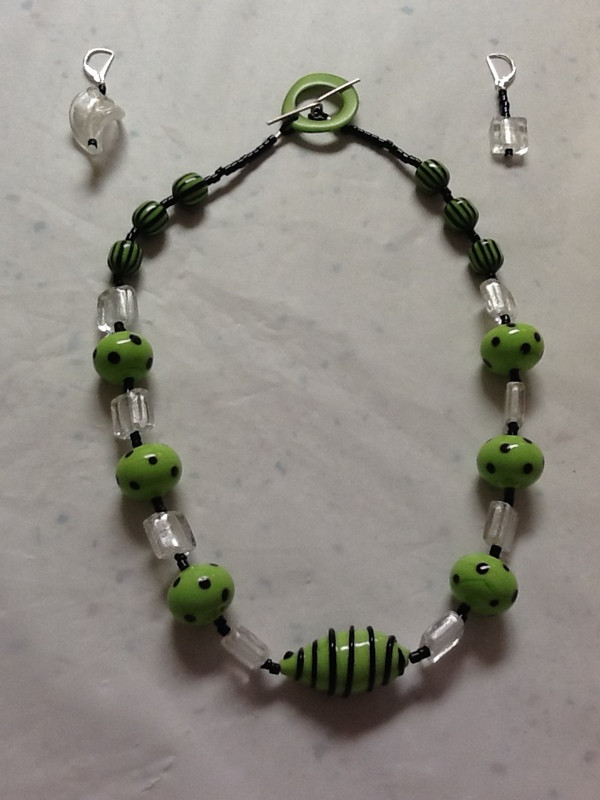 Pulling out four harmonious strands plus spacers, seed beads and a few accent beads was easy. More difficult but so delightfully intrinsic to the creative process was moving the beads around my design board until harmony emerged. Only then could I start stringing. I worked until I had four strands of 9—10” on each side of the centerpiece. Then came the challenge of conforming four straight lines into a necklace that hangs around a neck in a flattering way. My model is Ada, a turn-of-the century mannequin I found in a Lisbon flea market in 1965 and put into service in 1995 as a neck model for multi-strand neckpieces. I pin the strands on her velvet form and figure out how many more beads are needed to fit each strand to where the clasp sits at the back of the neck. A word about the centerpiece. Luminous and glowing green on top and opaque and creamy on the bottom, it is a fat lampwork glass circle which is perfect for gathering four strands. 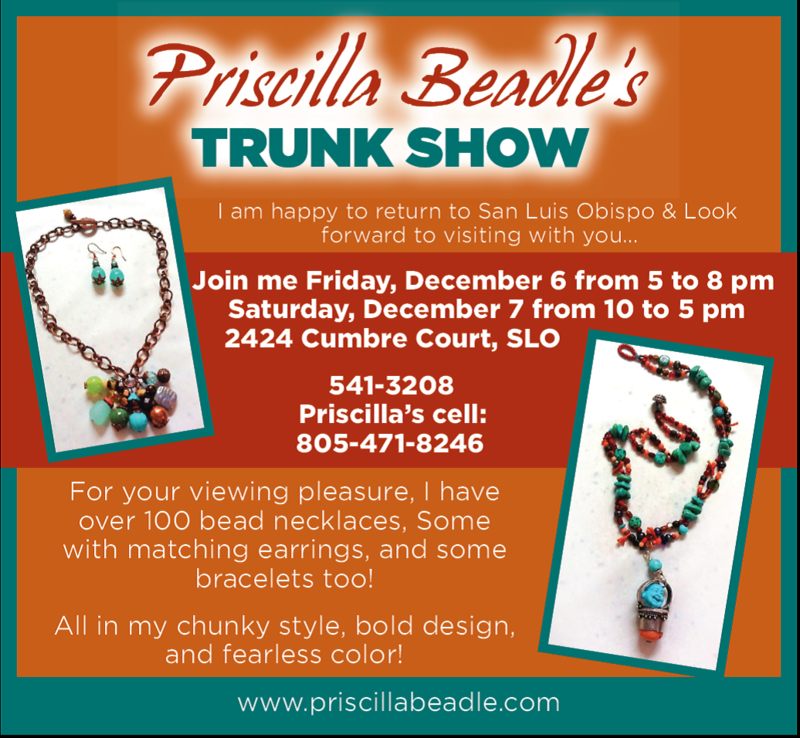 Artist-made and acquired in California twenty years ago, it found a happy home in this necklace. 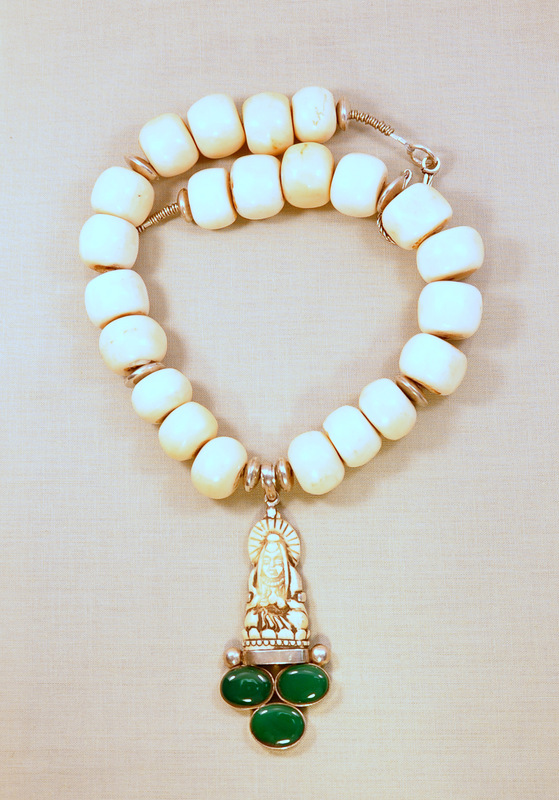 A strand of green and cream Japanese ceramic beads which I have had equally as long are also featured. Taking them out of Drawer 5, I noticed an old paper tag which said “Made in Japan”. Starting in the 1920’s, the U.S. Customs Bureau required imports to be labeled or marked with the country of origin. In 1952, paper tags were mandated, launching an era of collectibles referred to as the Golden Age. The tag is attached to those beads in this necklace. Other special beads are the vintage six-sided Italian glass canes, the square Czech beads from the 1940’s and the faceted sparkling vintage Italian seed beads between the canes. I chose a gold clasp to reflect the warmth of this necklace. 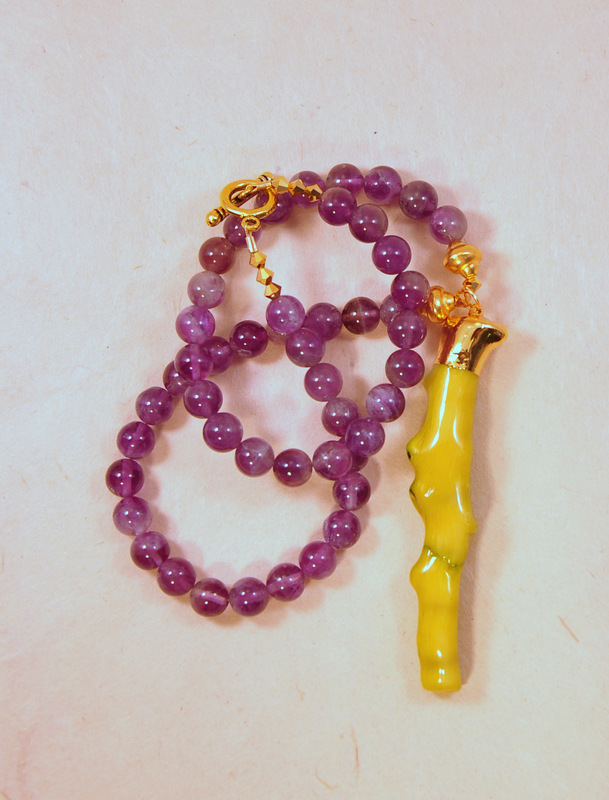 I also made 2” long earrings to accompany the vintage beads in the necklace.